Kelli O’Hara, as Cathy, and Brandon Victor Dixon, as Raymond, rehearse a scene from “Far From Heaven,’’ a new musical adapted from the 2002 film. NEW YORK — The way Richard Greenberg tells it, the idea sounds almost accidental. 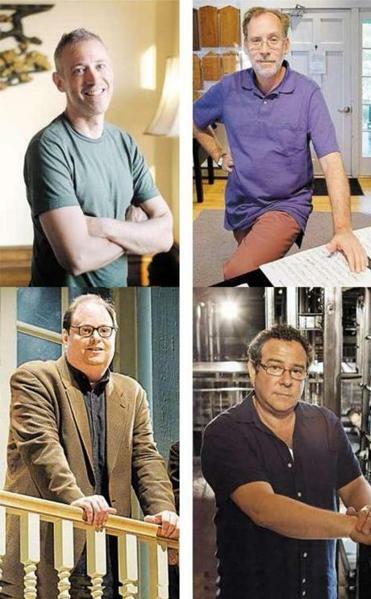 Five years ago, in July 2007, the playwright caught the last Broadway performance of “Grey Gardens,” a musical whose composer, Scott Frankel, he had “known a little bit for a hundred years.” After Greenberg, a Tony Award winner for “Take Me Out,” told him he admired the show, Frankel suggested that they work together. But the project Frankel proposed didn’t appeal, so Greenberg countered with another: Why not make the movie “Far From Heaven” into a musical? Todd Haynes’s 2002 art-house film stars Julianne Moore as Cathy Whitaker, an upscale housewife in 1957 Connecticut who has an outwardly enviable life: a handsome executive husband, two young children, closets filled with knockout period styles. But the facade cracks when Cathy discovers that her husband (Dennis Quaid) is gay, and as their marriage disintegrates, she scandalizes segregated Hartford by spending time with her gardener, a black man named Raymond (Dennis Haysbert). The milieu is Eisenhower-era conformity, rigidity, and repression; the tone tends toward somber melodrama. As material for a musical goes, it doesn’t exactly lend itself to characters bursting exuberantly into song. Frankel wrote the music for O’Hara, who has been involved in the project since the day early last year that he went to her house and played it for her. Now O’Hara, pleased to have a role designed for her voice in a musical with substantial narrative stakes, is spending her vacation from “Nice Work” performing in “Far From Heaven” at Williamstown. “I’m not proud of that,” said the actress, who in the lead-up to Williamstown had been rehearsing the new musical every day, doing eight shows a week on Broadway, and feeling the tug to spend more time with her 3-year-old son. “It’s one of those things where I argue with myself: Should I stop everything and be a mom right now? But then I think, for a woman in this business — well, anybody in this business, but especially a woman — I feel like you strike when the iron’s hot, and then, not by your choice, you back off from things. Things get slower. O’Hara has never seen the movie “Far From Heaven,” so there’s no danger of her imitating Moore’s performance. But Frankel didn’t have the option of innocence when this project came up: He saw the film twice when it was in theaters, so its lush score — music that, to Greenberg, “always seems on the verge of singing” — was already in his head. Frankel’s affection for theater music and pop music of the late ’50s is evident in his own score, he said, but so is his regard for the orchestral music that surges through the film. While Frankel leapt eagerly into the adaptation, flying to Portland, Ore., to talk with Haynes about it, Korie wasn’t convinced until they began writing songs that “Far From Heaven” could even be a musical. He was adamant, even as Greenberg encouraged him and Frankel toward through-composition, that he did not want it to be an opera. 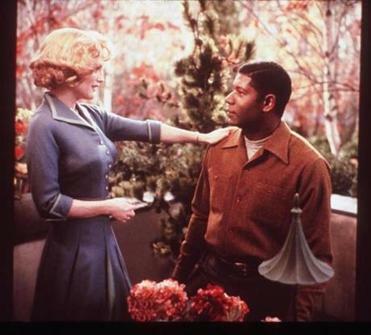 Cathy Whitaker, played by Julianne Moore, talks to her gardener, Raymond Deagan, played by Dennis Haysbert in the 2002 film "Far From Heaven." Ultimately, for Korie, the lure of the project came from the three main characters. How to get it all across in a stage production is the task facing Greif, who praised the film — a homage to Douglas Sirk replete with references to movies of the period — as “a great triumph of a dance between style and substance.” For the musical, he said, it’s crucial to locate the balance the movie did, never toppling into camp. “It got you dangerously close to it, so there was that titillation, but it never crossed the line, and I think that is a great challenge for us,” Greif said. So, at Williamstown, much of the purpose is discovery, and the creative team expects a significant amount of change between this summer and next spring. As for “Far From Heaven” being the first all-subtext musical, Greenberg’s attitude pretty much is “God forbid.” Then again, he said, what’s left unexpressed by these characters in 1957 America would be hard for a contemporary audience to miss.